One thing is for sure, you are either a fan of "oversized" cigar ring gauges or not. 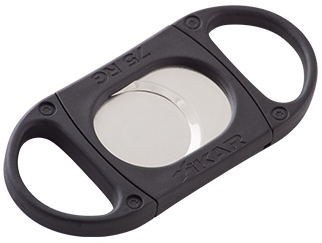 Xikar has always had a nice range of cigar cutters. That said, even I on the rare occasion smoke a 60 ring gauge neither my V cutter nor my Xi3 worked optimally. With the new popularity of gargantuan sizes Xikar has a new cutter. Called the X875, it is a double guillotine cutter that can take down the cap of an 80 ringer! I personally am not in the market for such a cutter, but I know there are folks out there that are in need of help. So here you have it, Xikar's press release on this big boy! XIKAR just got a whole lot bigger and better with the X875 double guillotine cutter. It takes a big cutter to handle a big cigar, and the X875 is the perfect tool for large ring gauge cigar smokers. The X875 can cut a 75 ring gauge cigar in half and easily cut the cap of an 80 ring gauge cigar! Everything is better when it's big!